NETWORK UPDATE: With the local football simulcast removed, both DANCING WITH THE STARS and CASTLE lost 0.1 from this morning’s numbers. ESPN’s MONDAY NIGHT FOOTBALL led the night’s cable, down 0.19 from last week’s game to 4.10. The night’s usual suspects took up the rest of the top 10. 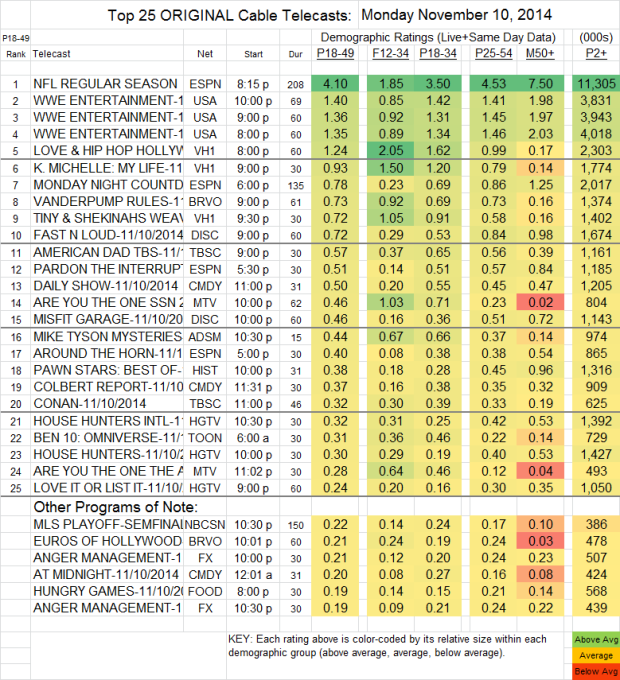 WWE (USA), at 1.35-1.40, was up 0.05-0.10 from last week. On VH1, LOVE & HIP-HOP HOLLYWOOD lost 0.11 to 1.24, K. MICHELLE: MY LIFE dropped 0.21 to 0.93, and TINY & SHEKINAH’S WEAVE was down 0.13 to 0.72. VANDERPUMP RULES (Bravo) gained 0.03 to 0.73. FAST N LOUD (Discovery) fell 0.17 to 0.72, and MISFIT GARAGE dropped 0.13 to 0.46. AMERICAN DAD (TBS) was down 0.03 to 0.57. MIKE TYSON MYSTERIES lost 0.05 to 0.44. ARE YOU THE ONE (MTV) dropped 0.11 to 0.28. ANGER MANAGEMENT (FX) was down from 0.28/0.27 to 0.21/0.19.